Munchkin is a game that travels well, as we've found from fans' calls for more storage and transport solutions, like our Munchkin Monster Box. And we always love seeing a well-traveled copy of our game out in the wild! Enter Johnny FD, a professional nomad, living minimalistically and traveling all over the world! He has very few possessions on him at any given time, so it's an honor that Munchkin is among them. It sits, beaten but obviously loved, among a small selection of card games. 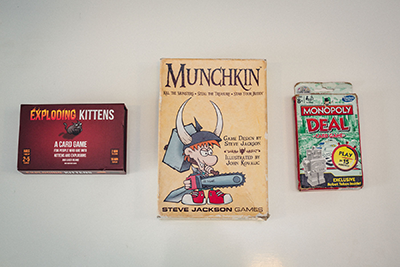 It's a great reminder of the power of gaming, and how universally appealing it can be to sit down and play a hand of Munchkin, no matter where you are. And if you don't like your games as "loved" as Johnny, you can always sleeve your cards, just in case. You can follow Johnny FD on his blog, and of course you can find your own travel copy of Munchkin at your local game store.